GigaTribe 3 for Mac (build 3.00.020) is available to download as a public preview! By installing GigaTribe 3 preview, please be aware that there are some bugs, and that the user interface is not Mac-friendly yet. Future improvements will be made when we start the beta-test. GigaTribe for Mac was announced months ago. It has been long awaited by our user community; we hope you will like it. GigaTribe 3 preview is built for Mac Intel only. Mac OS 10.4 or later is required. 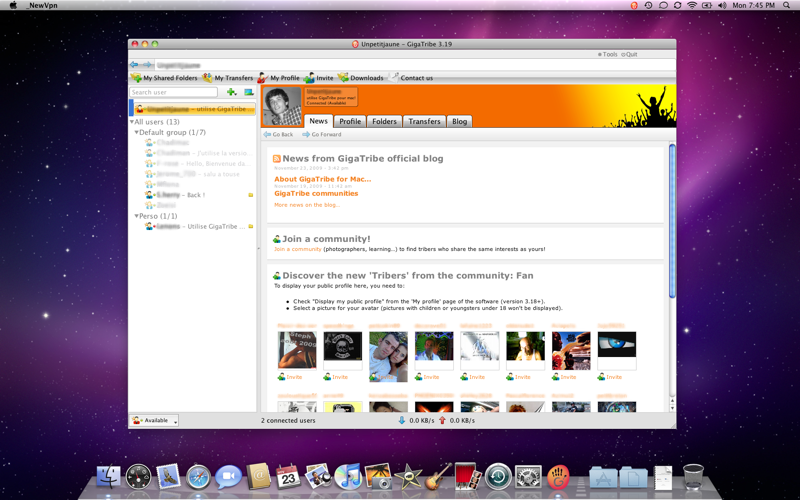 GigaTribe 3 preview works well on Mac OS 10.6 Snow leopard. GigaTribe 3 public preview for Mac is available only by clicking here. It is time to post your comments! GigaTribe 3 for Mac has been under development for several weeks, and the first alpha version is running pretty well. For now on, we need to fix an major bug that is causing multiple crashes. Here at GigaTribe, we love the Mac, and we are eager to release the first beta before Christmas! We hope our Mac users feel better now. GigaTribe for Mac is in progress and it is going well… stay tuned – coming soon to a Mac near you! We’ve been announcing GigaTribe Mac version for a long time now. The good news is, yes, there will be a Mac version. Version 3, released for CES in January, has been developed using a cross-platform application framework. It means once the application is running, we’ll be able to deploy it across many desktop and embedded operating systems without rewriting the source code. In practice, we’ll deploy the Windows version first and a Mac beta version will soon follow. The official Mac version will probably take a few extra months, as we need to make sure the Mac beta testers are sending positive feedback. To apply for the Mac beta version, just send an email to contact@gigatribe.com with “Mac Beta version” in the object field.